In My Kitchen Garden: Garden Journal 10-22-10: It's Time to Plant Garlic! For some reason onions are supposed to be planted in the first quarter, along with lettuces and other greens, beans, broccoli, cabbage, brussels sprouts, etc. Peppers, eggplant, melons, and tomatoes are best planted in the second quarter. I don't know who decided all this stuff; I just try to follow along because I need all the gardening help I can get. Today is the full moon (woohoo! ), which means the third quarter starts tomorrow. Fertile days for October 2010 are the 23rd (tomorrow), the 28th, and the 29th. Sunday the 24th is also a fertile day, but some people believe that all Sundays fall into that unfertile 'blackout' category, when you really shouldn't do anything in the garden except harvest, weed, mulch, and control pests. Sometimes I wish I'd never heard that rule because now I'm paranoid to plant anything on a Sunday. Fortunately garlic is somewhat forgiving, because although I have the best intentions every year, I rarely end up planting mine on time. My 2009 crop, which should have gone into the ground in October 2008, wasn't planted until February of 2009. At least, as you can see above, I had some cute critters keeping me company while I worked. Unfortunately the resulting garlic was pretty pathetic. Determined never to do that again, this year's garlic didn't go in the ground until March. Some progress, eh? I actually still ended up with a fairly decent harvest, although only from the garlic I'd purchased from some of our Amish neighbors and planted. The much smaller heads of garlic from my own garden (the ones planted in February 2009) didn't do very well. They started growing okay, and then the spindly plants just sort of disappeared into the weeds. What's happening now, though, is that whatever small cloves that did form during the spring have resprouted and are growing nicely—right in the middle of the bed of Asian greens I planted in September (and which is providing delicious 'thinned' baby greens every day for salads). It'll be interesting if the plants get big enough to harvest for green garlic, which tastes divine. If not, the mildly flavored leaves will make a tasty addition to salads. You can read more about this year's garlic harvest—and about growing and planting garlic—in my 7/27/10 post: Harvesting Really Late Planted Garlic. This time I'll be planting some of my own garlic I harvested in July, along with several heads I purchased a few weeks ago from our Amish neighbors. This Amish garlic, which is about two-thirds the size of those nice big heads I bought from them last winter, was grown here in Missouri. The better stuff was grown last year in Minnesota. Apparently we're not in prime garlic growing country, even if you're Amish. I'll plant the bulbs about 2 inches deep with the pointy sides up in one of my 4'x8' raised beds, spacing the rows at least 6 inches apart. If you have enough garlic to plant them 3 inches apart, you can harvest half of them as green garlic in spring. You'll find my green garlic fettuccine recipe and more about growing green garlic here. Garlic appreciates fertile soil, so I'll probably mix some compost into the bed first (as soon as I pull out all the overgrown weeds), along with some sheep manure. If I remember, I'll also add a few handfuls each of kelp meal (which we buy in 50-pound bags and feed to the animals as a vitamin and mineral supplement) and gypsum (calcium sulfate, which is one of the things we use to organically fertilize our fields). 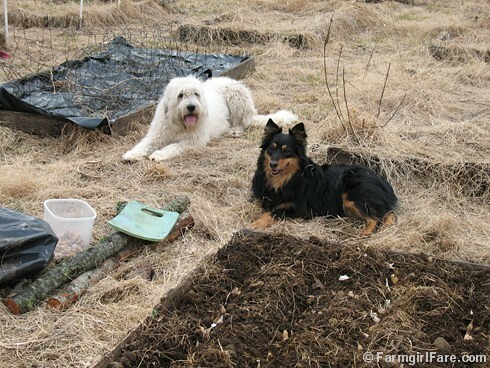 Garlic is defenseless against weeds, so I'll mulch the entire bed with a heavy layer of sheep manure bedding hay from the barn (you can see a photo of a half-mulched garlic bed and read more about fertilizing with sheep manure here). The mulch will also help keep the ground from heaving during winter and early spring extreme temperature fluctuations. What's great is that the mulch gives the plants a small dose of organic fertilizer each time it rains or you water, until eventually all the manure works its way into the ground, and you're left with a hay barrier impervious to weeds. And then that eventually breaks down and helps amend the soil, too. Depending on the weather, tiny green garlic sprouts may poke up through the mulch during the coming weeks, and then as the temperatures drop the growth will stop. Once the garlic is planted and mulched, nothing more is required of the gardener until February or March, when you then have to jump for joy at the sight of those little green shoots reaching happily towards the sun. Replenish the mulch as necessary, and pull any weeds that dare poke through. Are you growing garlic this year? Any good tips, stories, mistakes, or recipes to share? © 2010 FarmgirlFare.com, the trying to be timely foodie farm blog where it's been perfect fall growing weather, except for the fact that we haven't had any rain in over a month, which means we have a lot less grass in our fields than we'd hoped. There's a chance of rain predicted for this weekend, and I'm really hoping we get some—even if it means postponing my garlic planting plans. After you plant your garlic, do you water immediately? Funny that you should post on this very topic, FG, because I've been thinking for about a week of dedicating a small garden bed to garlic. Of course, Georgia isn't exactly the ideal place with the ideal climate to grow garlic, but it's worth a try. And here I was just feeling bad about NOT getting my garlic bed dug up today. I really needed to, because we're in a rare dry period finally, and the next four days call for rain so the soil isn't going to be workable. But then we had a visitor and I had to clean up the house some, and then I spent far too much time breaking my back trying to clear the black walnuts out of the flower beds, and then there's this baby that seems to, like, NEED HIS MOTHER or something . . . and then I see this post! So thanks for the reminder that I didn't accomplish what I really wanted to do today! We usually have rain (or snow - if I'm planting garlic really late!) on a regular basis after planting, and often the soil is already fairly moist. That said, we haven't had any rain here in over a month, so I might just go ahead and give the garlic a good soak after planting (which didn't get done yesterday!). Watering definitely shouldn't hurt the newly planted garlic, so I would say to do it. Great to hear from you! I bet you could probably grow some pretty nice garlic down there. It doesn't require a cold winter, as evidenced by how much of the U.S. crop is grown in mild areas of California. As for sheep manure, you know I highly recommend it. You won't believe how happy it will make your plants. Hi :) I am just visiting your blog for the first time, and wanted to say that I LOVE it! I will be back for sure!! Wonderful topic! Garlic lovers unite! I just planted 18 cloves this weekend - in moist soil. Hopefully, the full moon (leading to waning phase) will turn out to be helpful. I look forward to watching progress and eventually, a great harvest! Along with some garlic from the farmers market. Together, it's a good mix of hardneck and softneck. Will make a plan to get some hay though. This is the first year I've ever had a wimpy garlic harvest. It usually performs exceptionally well for me. Our summer in the Pacific Northwest was very cold and rainy this year, and I think that must be why. I just found your site and adore it! I'm afraid I got a little carried away with my garlic order this year...eight different varieties, and an amazing amount of bulbs--I gave some to a friend for her garden. Sadly--I still haven't gotten our large garden bed planted--eek! I'm hoping to tackle it this weekend. Look forward to reading more of your gardening stories! I have yet to have much success with garlic. Not that it does not grow but more that it does not get adesirable size. I have new land to play with and opted to plant winter rye for improving the soil for next year. Hopefully next year in this new soil, will provide a much better crop. Our neighbor raises garlic in mass amounts. Hopefully he will share some of his tips when we plant next year. Going to book mark the link for moon sign planting. I do love when I come to visit your Kitchen blog garden. It not only gives great pleasure for my insatiable kitchen garden soul but serves as a reminder on things to do. Love your "moon timing" hints - will have to follow that for my garlic next fall. Do you plant hardneck or softneck garlic? I have both planted from last fall - can't wait to see which does better. Thanks for the tips! I plant hardneck garlic. You can read more about it - and why I prefer it over softneck - here. I think it's great that you tried growing both at the same time. There's nothing like being able to compare two varieties of something that were grown in the same conditions.